I didn't need to be at my cousin's in Cartersville until 5:00 pm so I planned some time to stop and play some disc golf. 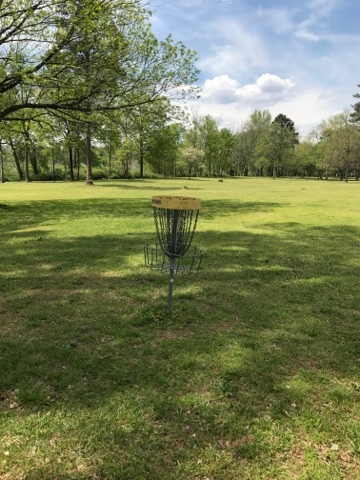 There was a nice disc golf course listed in Rome, GA at a private college, but it was a gated college and I opted for a single basket course in a local park. The one basket is in a park with a large open area with some mature trees. I decided to practice driving and putting to the basket from different angles to get some practice in. My Cousin I stay with is very kind and works with the area homeless to help them with food, essentials, and blankets that she gets donated to her from others and groups. She used to arrange and cook hot meals and deliver them to the homeless once a week but is doing a more solo effort right now. Above is one of the parking lots we visited. 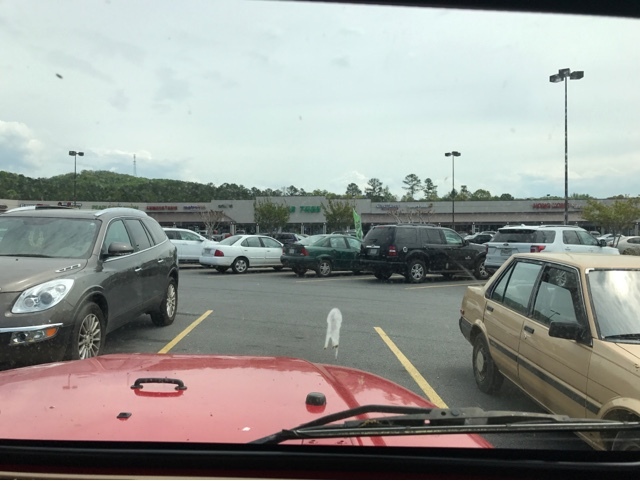 The first parking lot she took me to there was a homeless man and woman she has never seen before. She gave them a box of food and bottled water and each a blanket. We later found out that although they were not sitting together, they are an item. One of the things that my cousin does is talk and listen to those she helps. It develops respect and builds trust. In the parking lot in the picture up above we met a woman that my cousin has known for a long time. She is pushing a 4 wheeled metal framed cart. She, like the rest live in area woods. Some have more means than others. As my cousin is talking to this woman from the car window, she introduces me and I am straight up asked by the woman if I would buy her a hamburger. I said yes and asked if she was referring to McDonalds in Walmart. She responded yes. My cousin continues to make small talk about how the woman is doing and what she knows about the couple my cousin met earlier. The homeless in general know of the others, but it doesn't mean they all get along. 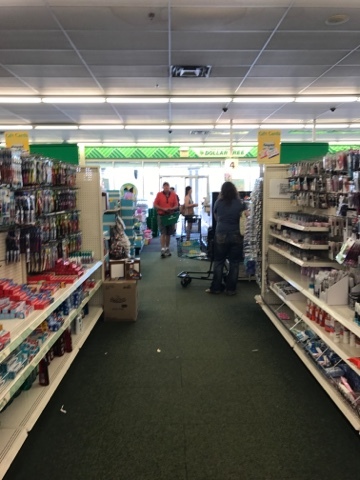 In the picture immediately above my cousin is now in a dollar store to purchase the homeless woman sun screen, and personal hygiene products. My cousin drops me off at Walmart where the homeless woman is waiting for me. She gives the woman the items she bought at the dollar tree store. I go inside with the woman and my cousin goes and parks her car. 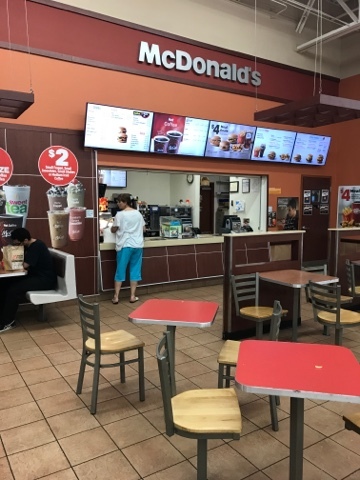 This McDonakds is in the back of the Walmart and we head there. We arrive and I tell the woman that she can order anything she wants. 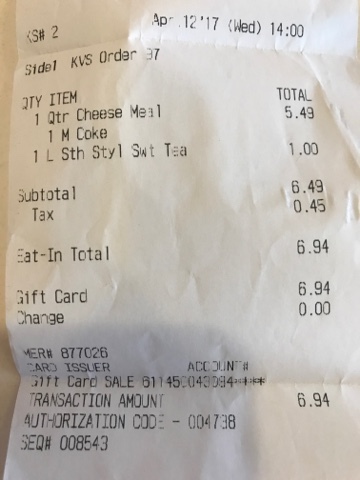 She orders a quarter pounder with cheese meal for $5.43. I order myself an unsweetened iced tea. The woman is nearly 60 and has an income, but it is insufficient to live on and therefore is homeless. She is not feeling well today suffering what she describes a 6 over 10 level of pain. My cousin and I depart heading out a different road from the shopping area and she spots a man sitting in a walker flying a sign about being a vet and needing help. My cousin pops out of the car to introducer herself, as this is yet another new homeless person to add to her list. He is a veteran and needs medical help on a regular basis, but has insufficient income to live off the streets. My cousin is such a nice person to take her time and money to help these poor homeless people. I am glad to have gotten the chance to spend this kind of time with her and to listen to the stories based on her experiences. There are people I know in the vandweller community that are able to live in a van instead of a house or apartment because of the high cost of housing. Some homeless are similar but have lower funds and live on the streets, or adjacent woods. I felt good helping today.